The benefits of purchasing a gas range for the kitchen are plenty, including instant heat when ignited, savings costs and ability to cook without power. But, if the ignition is not working on the gas stove, then it's time to problem solve. 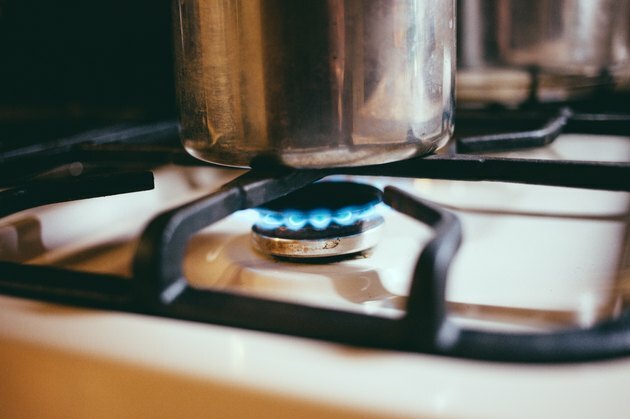 Often, these problems can be solved by the homeowner, but discovering and fixing the issue usually requires looking under the lift top of the gas range. There are several steps to take, and each one must be done in order. Before you lift the top of the gas stove, determine if the problem can be solved by cleaning the top of the range. Often, food crumbs or a grease build-up blocks the gas flow to the igniter. To clean, remove the grate from the non-working burner and gently wash the area with a warm, soapy washcloth. Remove the soap with a wet washcloth, then dry. If there are any remaining bits of food, remove them with your fingernail, a toothpick, a needle or similar object. You can even use compressed air. After all the food and grease have been removed, replace the grate and turn on the gas stove. If it still won't ignite, then it's time to lift the top. First, shut off the gas supply. Next, remove the burner grates, burner caps and bases. Depending on the gas oven model, the base may be attached with screws. Once removed, place these in an easy-to-find – yet out of the way – location so they aren't accidentally knocked off the counter during the gas range repair. One option is to drop them into a clean cup or bowl on an opposite counter. Once the bases have been removed, remove the screws to the burner tubes if necessary. The lift top is now ready to be raised. As you begin to pick up the lift top, release the spring clips by inserting a putty knife between the top and the clips. The clips will be located in the front or on the sides of the oven. The lift top can now be removed or propped open with a large pole or stick depending on the model of your gas oven. Once you have removed the lid, check to see if there is a loose connection. If the wires aren't properly secure, they will not be able to create the spark necessary for ignition. To fix this problem, secure any loose connections or reconnect any wires that are currently disconnected. A faulty igniter may be another cause. If all connections are secure, check to see if the igniter switch should be replaced. To do this, turn off the lights and turn your knob to the ignite position. If the sparks are yellow or orange instead of blue and white, you will need to replace the gas oven igniter. Make sure to purchase the correct igniter for your gas range. Replacement is usually simple as you can disconnect igniters without needing to cut or splice wires. Once all repairs are complete, the lift top must be replaced in the reverse order of how it was removed. To begin, slide the top back on the stove or remove your support and gently bring it down. Press down to confirm that the spring clips have reattached and the lift top is securely locked into place. Next, align the holes in the top with the burner tubes. Then, if applicable, screw them firmly into place. You can then replace the burner bases. Carefully line up the electrodes with the slot or hole in each base and, if applicable, secure the base with mounting screws. Finally, replace the burner caps and grates. Once your gas stove has been reassembled, you can turn on the gas supply and confirm that everything works properly.